Storing clothes is one of the biggest headaches in the organization of a bedroom. Whether it’s big or small, when we plan the decor of a bedroom, one of the things that most concern us are the furniture and cabinets that we are going to put in it, but, what options do we have? One of the most conventional options for storing clothes in the bedroom is the use of a wardrobe closet. There are many modular wardrobes, so we can choose the one that we like most considering our personal taste, our needs or the decorative style of the bedroom. Nowadays, the modular wardrobes for the bedroom are fashionable, allowing you to create the perfect wardrobe by joining different modules that you can choose at your taste. These types of cabinets are the most suitable for our needs since we can choose the internal organization that we want: shelves, hangers, shoemaker, drawers, etc. The wardrobes are trend in interior decoration, while many new construction homes include them in the rooms. These types of cabinets allow optimizing the space of the bedroom to the maximum and usually have sliding doors to make them more functional. 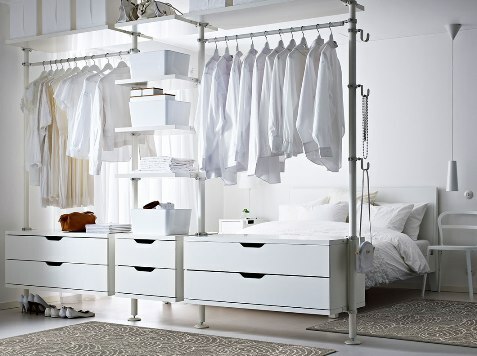 Open wardrobes for storing clothes are also trend in bedroom decorations. This type of cabinet only shows the internal structure of the cabinet, without any housing covering it. Open wardrobes are ideal in case of having a small bedroom, although it is discouraged if you are a disorderly person. Chests of drawers are used for the storage of folded clothing such as t-shirts and underwear. By being able to keep clothes folded, it takes up less space than a wardrobe with hangers. Many people combine closets with Chests of drawers. The dressing rooms are like large closets wardrobes that allow us to enter and dress in them. This type of storage system is optimal to take well separate the clothing from our bedroom (opposed to open cabinets). Many houses have dressing rooms included in the double bedrooms, although it is possible to choose one of the rooms without use of the house to make you a dressing room to your taste.